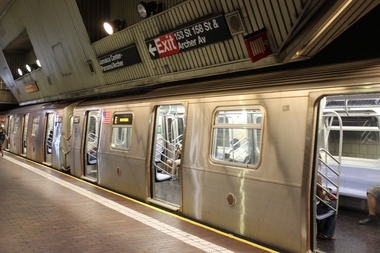 A man was hurt after he walked into an E train as it was pulling out of the Jamaica Center-Parsons/Archer Avenue station Wednesday morning, officials said. JAMAICA — A man was injured after he walked into the side of a moving E train in Queens during Wednesday morning's rush-hour commute, authorities said. The man, whose name and age were not released, walked into the Manhattan-bound E train as it was pulling out of the Jamaica Center-Parsons/Archer Avenue station near 158th Street at 8:22 a.m., FDNY and MTA officials said. He was taken to Jamaica Hospital and treated for a head injury, officials said. A train dispatcher said that just before the incident, the man was sitting on another Manhattan-bound E train directly across the platform and suddenly got off. “He got off one train and was walking towards the other train, but it was already leaving the station,” the dispatcher said. He was bleeding from his head after he walked into the train, the dispatcher said. There were no train disruptions as a result, an MTA spokeswoman said.